Home › Home and Kitchen › Sasquatch 30 Oz Stainless Steel Tumbler With Lid & 2 Straws (Curved+Straight)..
Sasquatch 30 Oz Stainless Steel Tumbler With Lid & 2 Straws (Curved+Straight)..
AMAZING VALUE4MONEY BUNDLE: 30 oz stainless steel tumbler + newly designed BPA-free slide/switch lid + 2 steel straws (curved & straight) + cleaning brush + beautiful package. DOUBLE WALL VACUUM INSULATED PREMIUM QUALITY: robust quality build, stainless steel double wall insulated, sweat-free: you won't feel the chill/heat when you hold your Sasquatch! TEMPERATURE RETENTION: keeps cold for up to 24 hours (we had longer results), heat for up to 6 hours. perfect for your ice water, coke, tea or soup! NEW DESIGN & A GREAT GIFT: comes in a beautifully-designed, original box, with the luxurious SLK brand & a BONUS 2 stainless steel straws, one curved and one straight - a terrific gift for everyone! we also added a straw cleaner as well! Bringing you the best value-4-money is our mission. snow's luxury kitchen is happy to announce the new & improved SASQUATCHtumbler! made from an exquisite premium quality 18/8 304 stainless steel, andscomes in a complete bundle to make sure you'll get the best value-for-moneydeal available! key elements: 30 oz monster capacity guarantees you'll have enough hot or cold drinkwherever you choose to go! BPA free, crystal clear plastic lid with the newly designed open/closeswitch, perfect with or without a straw! made from top-notch quality 304 stainless steel that will last you alifetime and will never rust. Elegant, smooth, silvery look. our tumbler is simply beautiful to behold. seamless finish: our tumbler is easy to clean, designed to keep unwantedflavors from your beverage. double-wall vacuum insulated keeps the chill & heat for long periods oftime. keeps ice cold for up to 24 hours (sometimes longer! ), and hot drinksfor up to 6 hours! sweat-free: retain the temperature perfectly inside. no moisture or heatslips out of the SASQUATCH! your hands are safe! beautifully designed with the SLK brand, and comes in a marvelous coloredbox - a perfect gift! Free bonus 2 stainless steel straws made from superior 304 steel, onestraight and one curved + a cleaning brush - just to make the entire packageperfect for you to enjoy! We at SLK care about our planet Our tumblers are Eco-friendly & environmental: when using the SASQUATCH, youtake care of both your health and our planet's as well, by avoiding the usageof plastic, paper, Styrofoam, Polystyrene etc. saves trees, money, and health. 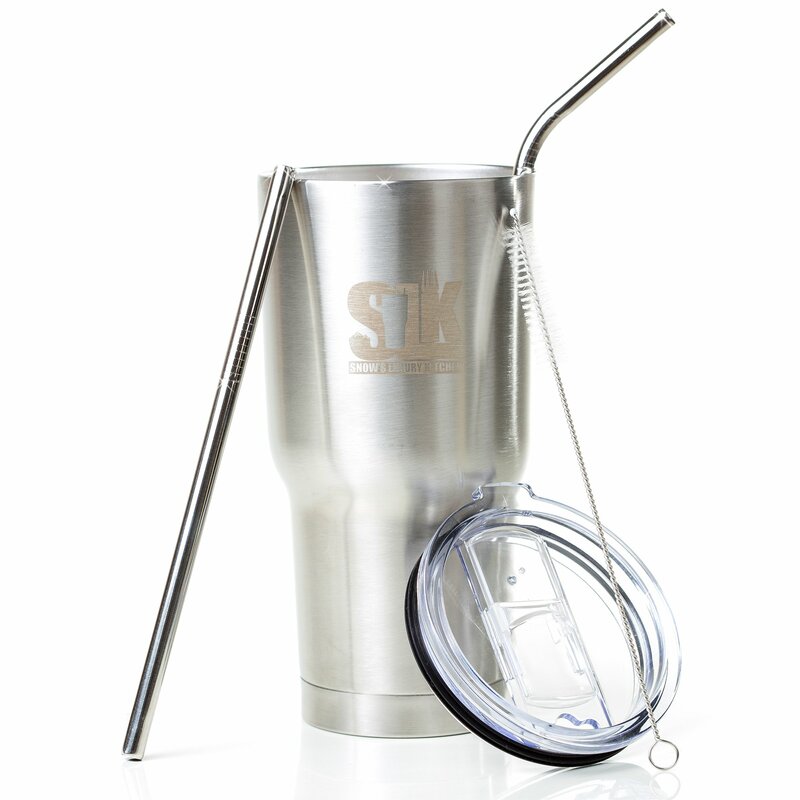 order your SLK SASQUATCH now and enjoy our special introduction price & free straw gift while it last! already have a Sasquatch? buy one as a perfect gift for the people you love toenjoy!